You’ve heard of smart houses. But can your turn your beauty shop into a smart salon? 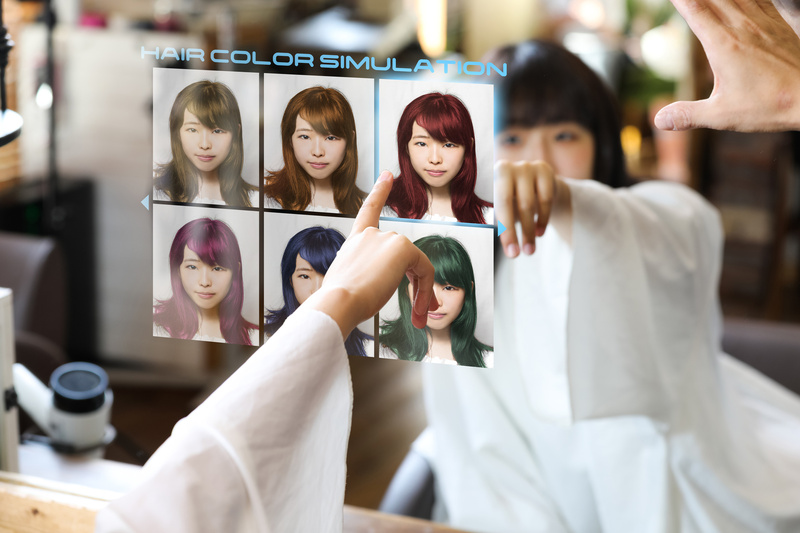 Click here to explore the future of salons. With more than a quarter million beauty salons and barbershops in the United States, you have more than hair to cut. You have to cut a niche for yourself by being a smart salon owner and making modern changes to your shop. Below are several methods to use to mix up your mojo and improve your numbers. Take a tactic from the travel industry and offer your clients online reservations, which around half of Millennials prefer. You’ll make it much easier for both you and your smart salon if you allow people to take this route. How do online salon reservations give you more control and get you closer to being seen as a future-looking establishment? Convenience. By allowing people to sift through your open dates and times, you improve your convenience to prospective clientele. They don’t have to pick up the phone and can check in even when your salon isn’t open. Customer Service. Imagine how much better your receptionist’s customer service ability will be if he or she isn’t spending time booking all appointments on the phone. By removing a potential time-eater from your receptionist’s day, you allow him or her to focus more intently on providing incredible service. Personnel Management. Why should your stylists and other team members have to call in to find out how many appointments are scheduled? A robust online reservation software service can allow them to see their schedules with a glance. This increases their ownership in their own work habits and behavior, which is always a good thing. Although online reservations will be an upfront investment, they will pay off by enabling you to set your smart salon apart from others that don’t offer this type of opportunity. Be sure to mention your online reservations system in all advertisements. When your guests come into your salon, what do they see? Are they greeted with older stations and mismatched furnishings? Or does everything seem to gel in a cohesive, themed way? Beauty salons of tomorrow must rely on a strong design. Even if you’re not a designer by trade, you can plan out a beautiful salon atmosphere and then buy the smart salon products that are perfect fits. Visual. What your clients see when they walk in the door will set the tone for your salon. Therefore, your color schemes must carefully fit. For instance, are you trying to woo females? The car industry says women love teal, gold and silver. Auditory. Do you currently have whatever radio station you feel like playing blasting day-in, day-out? You might want to move to a more reliable station or even opt for Pandora or Sirius. You’ll be able to adjust the tunes to set a specific mood. Olfactory. Scents play a huge part of smart salon life. While some odors are tough to control, consider ways to minimize stronger smells like bleaches and chemicals. For instance, you may want to incorporate an inexpensive aroma diffuser in your waiting area to mask other odors. Everything from your hand towels to your logo should tell a story about your salon. Make sure it’s the same story for every customer. And feel free to check out other salons for exciting set-up ideas. It’s no secret that consumers everywhere are interested in working with businesses that support the environment. About three-quarters of Nielsen survey respondents said they made all choices based on eco-friendliness. The beauty salon industry is no different. Does this mean you have to change everything in your shop? Of course not. For instance, though it would be great to have bamboo flooring unless you’ve already budgeted for new floors, you don’t need to go that far. At the same time, try “greening” your smart salon to attract new clients. It’s easier than you might think when you invest in specific items and then mention this in your marketing. Shampoos, conditioners, styling products, etc. Try out a variety of emerging green products specifically designed for high-quality smart salon use. You may need to test a few before discovering the ones that work the best for your stylists and clients. Towels and related products. Why not make a point by buying towels that are eco-friendlier? For instance, look for beauty supplies that have been manufactured out of sustainable products in a responsible way. Recycling. How do you currently recycle used materials, like plastic bottles? Be sure that you’re doing your part to be good stewards of the planet, and not adding to landfills. Communications. Do you still hand out paper receipts and even appointment cards? Offer texts, emails or other virtual methods of communication instead. It’s one less thing to throw away, which should reduce your garbage bill, too. Talk to your stylists about their preferred green living and working techniques and thoughts. You might be surprised at what they bring up as solutions that will appeal to contemporary customers. Even if you’re not the most tech-savvy salon owner, you can still be a smart salon owner and offer e-newsletters. An e-newsletter sent out monthly does a few things. First, it allows you to stay in front of customers who have opted into learning about your salon. They expect to get notifications from you, and will likely open them. Secondly, an e-newsletter puts the proverbial “bug in their ear” that it’s time to set up an appointment. Never assume that people will call you when their hair gets shaggy or unruly. Individuals are notorious for waiting until they get a nudge to make a decision! Finally, an e-newsletter gives you some solid branding. After all, if you have a salon theme, you can carry that theme forward with newsletter you release. Highlight new products. Are some of your stylists using new hair color products? Are you selling a new line of hair styling tools? Be sure to write a paragraph or two explaining their benefits for customers. Talk about continuing education. Stylists regularly attend continuing education courses and conferences to learn about the industry. Discuss your stylists’ latest learning experiences in an e-newsletter. Introduce personnel. Did a new stylist join your team recently? That’s something you’ll want people to know about. Add his or her picture and a brief bio to get people talking. Community service. Does your shop tackle community service projects now and then? Toot your own horn and tell the world in your e-newsletter! Specials and coupons. Don’t expect your customers to head to your website to look for specials or coupons. Send them right to their inboxes in your e-newsletter. Generally speaking, you can add anything you want to your e-newsletter. Just make sure it’s relevant to your smart salon, as well as to your readers. Do your stylists tend to wait until their customers ask them to try a new hair trend, rather than bringing it up themselves? This is a mistake that’s easy to reverse. Rather than sitting back, take a bold stand by encouraging everyone on your team to get to know the latest hair, make-up and even clothing trends. Why is this important? In essence, it shows that you’re a leader in your industry, rather than a follower. No, not all your customers will want to try something new, but many of them will be up for a funky ‘do or clever make-up styling. Talk to creative customers about giving them a free or reduced-fee haircut in exchange for being able to take a picture. You can use the picture on your website or e-newsletter (or both) to entice others to try something fresh and exciting. Make a practice of testing new hairstyles on your own team members. Customers often decide to get new hairstyles based on what they see when they come to their favorite smart salon. When you’re seen as the go-to stylist in your town for all things contemporary, you’ll start to see younger business. And those younger people will happily stay loyal to the place that knows what they like! Time for a Fun Evolution! Moving your standard salon toward a smart salon environment will take a few modifications, but you don’t have to feel overwhelmed. Start by making some switches here and there, and then work your way toward completely revamping your image. Over time, you’ll discover that you’ve not only enhanced the way you appear to consumers in your market but to the stylists you attract. Considered about paying for your salon facelift? Financing is available to qualified businesses.